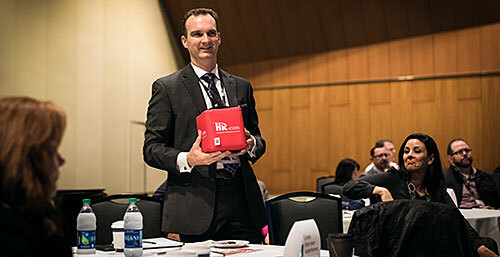 Chad Hall, a UHV alumnus and general manager of Regional Steel Products Inc., leads a roundtable discussion on Feb. 8 during the Leadership Excellence and Development 2017 conference in Nashville, Tenn. Hall and Regional Steel were recognized at the conference for excellence in leadership and customer service. When University of Houston-Victoria alumnus Chad Hall first joined Regional Steel, he brought an important philosophy with him: People are the most important resources businesses can have. That philosophy was a crucial part of why Hall and Victoria-based Regional Steel Products Inc. were honored at the Leadership Excellence and Development 2017 conference awards on Feb. 7 and 8 in Nashville, Tenn. The LEAD awards recognize the world’s top leadership practitioners and rank the top 10 percent in each leadership category in the Winner’s Circle. Hundreds of companies and programs apply for the awards each year, and winners and rankings are published in the February issue of Leadership Excellence Essentials magazine. Regional Steel was named to the Winner’s Circle as fifth out of over 100 eligible companies in the Best Customer Service Leadership Training Program category, which included businesses such as Southwest Airlines, Synchrony Financial and CIGNA Corp.
Hall was named to the Winner’s Circle and ranked 12th in the Top Corporate Leader Award for leaders over the age of 35 out of over 350 qualified candidates. Hall earned his Strategic Master of Business Administration in management from the UHV School of Business Administration in 2004. Hall has relied on the training he received at UHV. The strategies he learned while earning his degree have helped him every step of the way, he said. LEAD 2017 is a two-day leadership forum designed to inspire leadership in people from all walks of life. Leaders attend in person as well as through live simulcast to hundreds of remote host sites internationally. This is the second time Regional Steel was honored as part of the Top 10 percent in the customer service category, and it is the first time Hall has received an individual award. In addition to the award, Hall was invited to conduct two roundtable discussions at the conference. The discussions covered customer service leadership and how he received his leadership award. Hall was nominated by Nikki Felcman, human resources and payroll coordinator at Regional Steel. The decision to nominate him for recognition was an easy one, she said. When Hall joined the company, he took a genuine interest in every department and started implementing changes to improve performance, especially in the area of quality control. A big part of the success goes back to Hall’s emphasis on the importance of taking care of employees and encouraging them to do their best, Felcman said. The people in the warehouse are proud of their successful record, and they work together to double check orders and keep that momentum going.